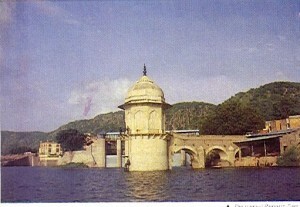 Ramgarh Lake is situated 32 km north – east of Jaipur in Rajasthan. A huge artificial lake created by constructing a high bund amidst tree-covered hills. The temple of Jamwa Mata and the ruins of the old fort are some of its antiquities, its beautiful landscape, especially during the rainy season and winter, make it an idyllic picnic spot. This entry was posted in Rajasthan, Ramgarh and tagged Lake, ramgarh india, Ramgarh Lake, ramgarh map. Bookmark the permalink.